Corderoy is involved with the business case for the proposed M56 to A6 Bypass. As you will see below, they don't appear to be running successful companies (I may, of course, be wrong about that), so why were they chosen for the important task of finding out how the Bypass would pay for itself. 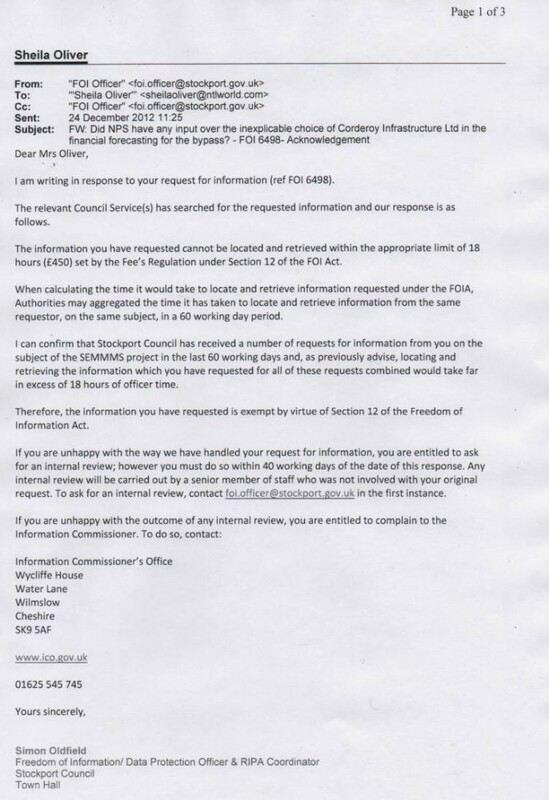 I asked that question of Stockport Council under the Freedom of Information Act. Although this is a current project, they feel it would take too much time for them to find out how and why this firm was chosen for the task. I have asked for a public interest test/independent review, but I am not hopeful of any kind of sensible response from Stockport Council. Stockport Council's current thinking on business rates, which they expect to part fund the bypass. "George Corderoy LLP was incorporated on 25 Sep 2006. The company's status is active, with a team of 2 directors. They have 6 subsidiaries. George Corderoy LLP have total assets of £0 plus total liabilities of £1,800. They owe £1,800 to creditors and are due £180,643 from trade debtors. Their book value is £178,843, and the value of their shareholders' fund is £178,843." "Corderoy Limited was incorporated on 05 Nov 2002. The company's status is active, with a team of 3 directors. Corderoy Limited is split between 2 shareholders. They have no known group companies. Corderoy Limited have total assets of £0 plus total liabilities of £1,015,740. They owe £1,015,740 to creditors and are due £936,114 from trade debtors. As of their last financial statement, they had £16 in cash reserves. Their book value is £283,990, and the value of their shareholders' fund is £283,990. " "Corderoy Project Services Limited was incorporated on 03 Sep 1985. The company's status is active, with a team of 5 directors. Corderoy Project Services Limited is split between 4 shareholders. They have no known group companies. Corderoy Project Services Limited have total assets of £0 plus total liabilities of £511,427. They owe £1,859 to creditors and are due £324,717 from trade debtors. Last year, they paid £-407 in tax and had £36,245 in cash reserves. According to their last financial report, the business made a gross profit of £8,897. Their book value is £4,691, and the value of their shareholders' fund is £4,691." "Corderoy Energy Limited was incorporated on 05 Sep 2006. The company's status is active, with a team of 3 directors. Corderoy Energy Limited is split between 2 shareholders. They have no known group companies. Corderoy Energy Limited have total assets of £0 plus total liabilities of £130,940. They owe £8,502 to creditors and are due £128,581 from trade debtors. Last year, they paid £-69 in tax and had £89 in cash reserves. According to their last financial report, the business made a gross profit of £6,081. Their book value is £1,432, and the value of their shareholders' fund is £1,432." "Corderoy Property Company Limited was incorporated on 28 Apr 1999. The company's status is active, with a team of 3 directors. Corderoy Property Company Limited is split between 2 shareholders. They have no known group companies. Corderoy Property Company Limited have total assets of £0 plus total liabilities of £28,896. Last year, they paid £-40 in tax and had £17 in cash reserves. Their book value is £2,531, and the value of their shareholders' fund is £2,531." "Corderoy International Limited was incorporated on 30 Oct 1981. The company's status is active, with a team of 3 directors. Corderoy International Limited is split between 2 shareholders. They have 1 subsidiary. Corderoy International Limited have total assets of £0 plus total liabilities of £1,154,625. They owe £196,032 to creditors and are due £378,509 from trade debtors. Last year, they paid £-61,153 in tax and had £874,790 in cash reserves. According to their last financial report, the business made a gross profit of £623,032. Their book value is £172,217, and the value of their shareholders' fund is £172,217." "Cil (Abu Dhabi) Limited was incorporated on 19 May 2005. The company's status is 'Non-trading', with a team of 4 directors. Corderoy International Ltd is Cil (Abu Dhabi) Limited's sole shareholder. They have no known group companies"
They might have some money in Abu Dhabi (who knows?) but shouldn't Stockport Council be dealing with companies based in the UK? "Corderoy Infrastructure Limited was incorporated on 05 Sep 2006. The company's status is active, with a team of 5 directors. Corderoy Infrastructure Limited is split between 2 shareholders. They have no known group companies. Corderoy Infrastructure Limited have total assets of £0 plus total liabilities of £2,001,140. They owe £15,352 to creditors and are due £805,538 from trade debtors. Last year, they paid £-16 in tax and had £15,190 in cash reserves. According to their last financial report, the business made a gross profit of £64,832. Their book value is £1,797, and the value of their shareholders' fund is £1,797." What we have forked out for this.